Steven Kaufman wrote an article in Entrepreneur about 7 tips entrepreneurs need to know before investing in real estate, which are great tips to ponder for even the most experienced investors. So we want to think about these seven tips with you, and encourage you to remain grounded with the basics of real estate investing. One of the most important things to do when you start thinking about real estate investing is creating an overall strategy. Begin by understanding your financial goals. Know what you expect your investments to deliver in terms of finances, while remaining mindful of the long-term and short-term advantages of real estate investing. While creating your investing strategy, think about the purchase price range, as well as the cash investment needed for each property. Also try to formulate a general holding period and exit strategy, while also deciding whether to work with industry experts to manage your properties and real estate investment portfolio. Educate yourself toward profitably investing in real estate, or else your education will turn into a hobby. Attending seminars, buying books, and watching videos can help. However, these educational tools should be used with precise goals in mind. Don’t be caught in the trap of endlessly buying books and courses without putting your knowledge into action resulting in profiting from real estate. When you start investing in real estate, you don’t have experience finding, buying, rehabbing, and flipping or leasing properties to tenants. So, take time to understand your local real estate market from an investing perspective. Look at numerous properties before they sell, and observe them through the process of rehabbing, flipping, and leasing to tenants. In time, you will develop an eye for properties that meet your investing criteria, and you’ll be ready to purchase your first property. Real estate investors are tempted to look for the perfect deal, especially when first starting to buy investment properties. But this idea of a perfect deal can paralyze investors to the point they never buy a property. Rather than trying to find the perfect deal, try to find deals that fit your investment strategy, while being mindful that no deal is perfect. Your real estate investing strategy should include the financial parameters by which you determine if a property is worth purchasing. Investment cash needed for repairs and upgrades before leasing to tenants. Financing strategy for the short and long terms. Bargain purchase (the percent under fair market value a property must be purchased). Immediate value increase (the percent in increased value you expect after making initial repairs and upgrades). Net cap rate (annual net income/total value). When you find a potential investment property that fits within the guidelines of your real estate investment strategy, you can pull the trigger based on the numbers rather than emotions and personal preferences. Motivated sellers are usually willing to work with buyers, so focusing on finding motivated sellers can result in making great deals as a real estate investor. As a general rule, then, you don’t want to buy properties from unmotivated sellers. Real estate investors who are liquidating their portfolio, especially if they are having financial difficulties. Properties that have been on the market a few months. Properties for sale that need repair. Buy from real estate wholesalers who specialize in purchasing properties from motivated sellers, then resell the property to investors at a discount from retail price. Many real estate investors have other businesses. For them, real estate is an investment like stocks and bonds. They don’t work full-time in real estate, and focus most of their attention on existing profitable businesses. Real estate investors who rely on other businesses for their livelihood must be careful not to become obsessed with real estate. These investors typically use industry experts to find, buy, and manage their real estate holdings. They can, therefore, focus on their existing businesses while starting and growing a real estate investing business. Investing in real estate is one of the best ways to grow your wealth, while creating a steady income that can be passed to the next generation. 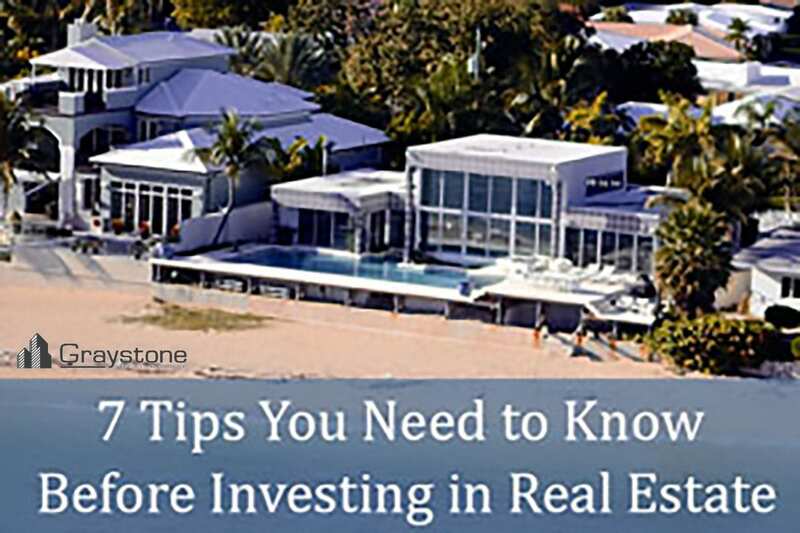 At Graystone Investment Group, we find properties that we resell to investors at discount prices, while also connecting them with private financing. We also coordinate with rehab and management companies we’ve worked with for years, at no extra charge. To start working with us, please fill out the Investor Profile, or contact us direct. Read Steven Kaufman’s article in Entrepreneur.